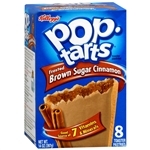 Kellogg's Pop-Tarts Frosted S'Mores toaster pastries 14.7oz 416g - 8 Toasters Chocolate and marshmallow filling camped out inside a chocolate-frosted graham cracker crust. Odds are, they're tastiest toaste Pop Tarts In the U.K.
Enriched Flour (Wheat Flour, Niacinamide, Reduced Iron, Thiamin Mononitrate [Vitamin B1]Riboflavin [Vitamin B2]Folic Acid)Sugar, Vegetable Oil (Soybean, Cottonseed and Hydrogenated Cottonseed Oil (Less than 0.5 g Trans Fat per Serving) with TBHQ and Citri *Produced from genetically modified maize. **May have an adverse effect on activity & attention in children.